The Cruiser Deluxe Jr. four wheel walker/ rollator offers a lower seat height and a lower handle adjustment for the smaller user. 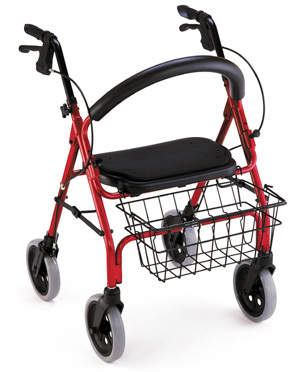 This light weight walker will fold easily to fit into most any small space. The sturdy seat allows the user to sit and rest when necessary. The adjustable hand brakes give the user more control, and the removable basket is standard and adds extra storage. Seat Height to Ground 19"
Adjustable Height 30.5" to 34.5"
Fits all folding and 4200 series walkers. 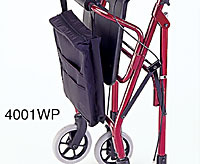 Velcro's to front crossbar of folding walker or backrest of 4200 series. Water resistance and adds storage for light weight items. 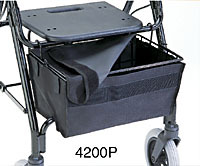 Fits 4200, 4202 and 4212 walker and rollator baskets. Water resistant basket liner adds privacy and security, with velcro top. Fits all folding 3 and 4 wheel walkers. 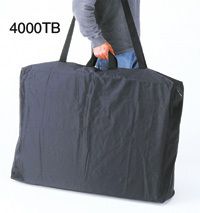 Nylon carry bag provides added protection for airline travel or storage. 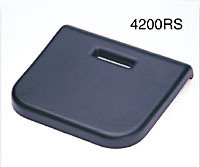 Rubber seat pad is 1/2 inch thick and provides relief from back fatigue while resting. Attaches to plastic seat with 4 screws. 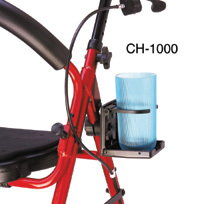 Cup holder attaches easily to all rolling walkers. Adjusts to hold different size items and folds when not in use.